As you might be able to tell from the event calendar, June is a music filled month for me! I kick off the month by performing the entire first weekend at Art in the Park Windsor. I’ve performed at an Art in the Park before, so I’m very excited to do so in Windsor, Ontario this year! 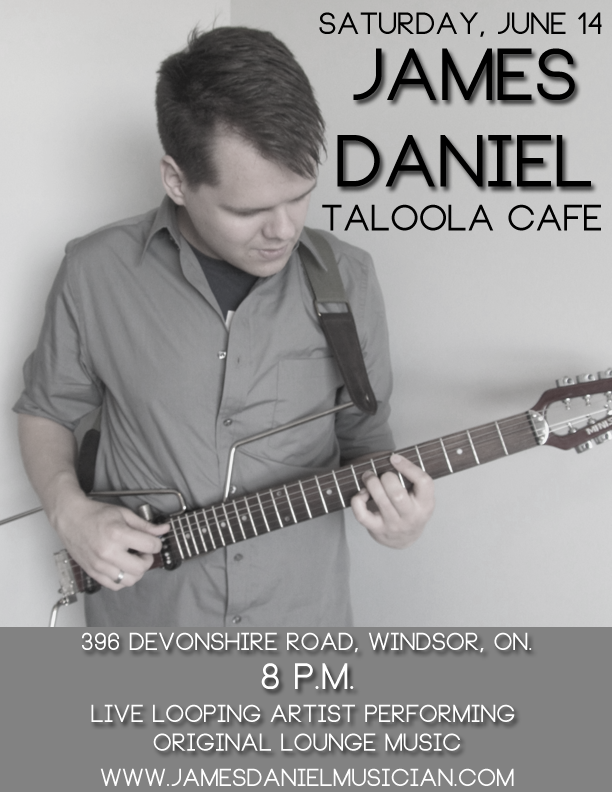 The following weekend, Saturday, I’ll be performing some original lounge music with my loop pedal at Taloola Cafe in Windsor, Ontario. This is my first time at this venue and I’m looking forward to performing for a new crowd and also trying out their menu. The show is open to the public and is free to attend. If you’re interested, all the information can be found on the poster below. Last but not least, I’ll be doing a short performance for Windsor’s Senior Expo the weekend after. I’m grateful for the opportunity to play live jazz at a great event. Don’t worry – because of my busy schedule, I have not forgot about my album. Still working away on it, and each performance I have is another stepping stone to the completion. I’m hoping to find some time this Summer to have an album fundraiser show in Warkworth, Ontario. If that happens, I will be sure to keep you all posted and hope to see you there for support!